Music has always played a part in the lives of Nebraskans, as it has for all humanity. This project was designed to share some of the Nebraska-made music that was written in the late nineteenth and early twentieth centuries. The vehicle for this sharing is a selection of sheet music that currently resides in the Polley Music Library in Lincoln. These pieces represent a broad sampling of the output of Nebraska musicians who range from out-and-out amateurs to professional teachers, performers, and composers. As such, the quality of the pieces varies widely, but all of them share the common thread of their Nebraska provenance. Polley Music Library has over 8600 pieces of sheet music in its collection. They came from the personal collection of Lillian Helms Polley and from years of so-called “piano bench” donations. We chose 110 representative pieces in which the music and/or the lyrics were written by Nebraskans (or, in a few cases, were written about famous individuals in Nebraska history). 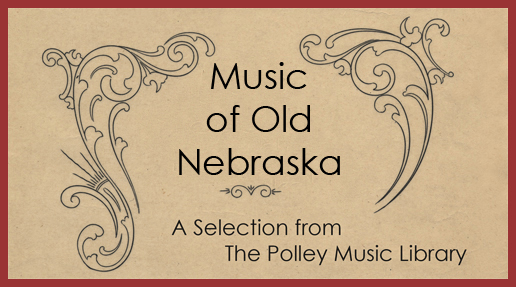 We entitled our project “Music of Old Nebraska”. Unlike many other online digitized sheet music projects, our aim has been to set the music in an historical context rather than just providing a catalog of the pieces, though that is present also. We created archival scans of all the music, cleaned them up using Photoshop CS, and converted them to Adobe PDF form. All of the pieces were published before 1923 and are in public domain. You may freely download, print, and perform any of them, and we hope you will do so! This project is supported in part by the Institute of Museum and Library Services under the provisions of the Library Services and Technology Act as administered by the Nebraska Library Commission. Additional funding has been provided by the Lincoln City Libraries, and the Swanson Biggs Adams Family Foundation donated funds for the writing of the lesson plans. We are extremely grateful to all of these organizations for making our project possible. It is possible to search our Music of Old Nebraska collection in several ways.The Titles, Authors, and Songs by Subjects catalogs are text only.The Authors catalog is annotated with biographical information about the composers. Clicking on an item in a catalog will take you to a metadata page for that piece. There you will find publication information and links to free downloads of the sheet music.